IMCDb.org: 2003 Ford Expedition Eddie Bauer Gen.2 [U222] in "Revolution, 2012-2014"
Clearly CGI. Looks terrible. But, there's a 1999-2006 Toyota Celica beside it. 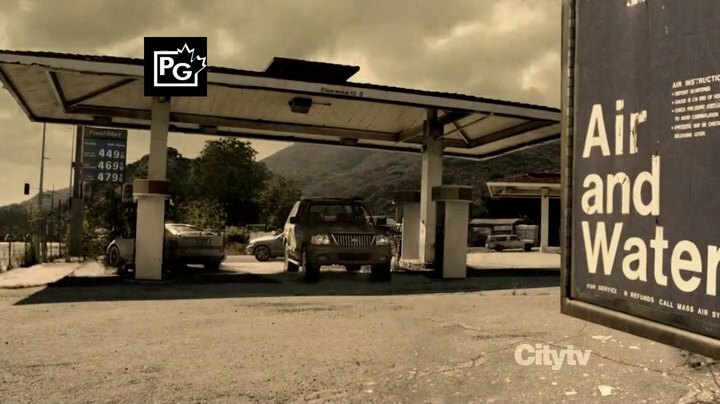 This is a time-lapsed transition scene that appears at the start of the show. A real Expedition is actually parked at the gas pump; they just gradually phase in C.G. dust, faded paint, rust, and vegetation around it, to make it look as if its sat there, abandoned for years.